All time awesome beautiful Jewelry Sets flower pendant with dangling pearls beautiful jewelry perfect wedding Necklace set. 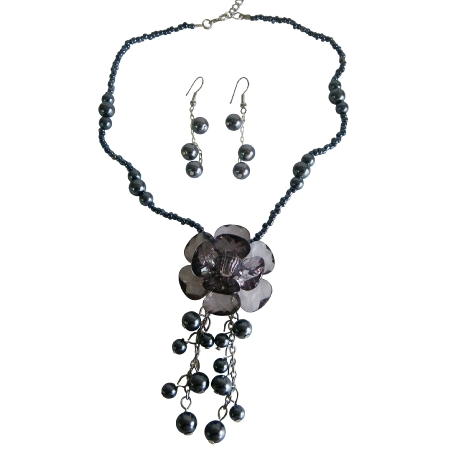 This dazzling Gray tiny Bead Necklace with Gray Glass Flower pendant with matching earrings 8mm pearls is just Awesome. The class combination of the Grey pearls with grey flower glass pendant & matching Earrings it as FABULOUS!! Giving you that TOP & a party event on you Neck & Ear lobes all the time! !.Add a dash of Elegance & Beauty to your CHARMS! !.